Cell-Based ELISA tests now enable precise measurement of the phosphorylation status or expression profiles of target proteins (biomarkers) in whole cells. In this post, a review of high performing cell-based assays is made. These Colorimetric Cell-Based ELISA Kits enable the detection of various target proteins (biomarkers). Some references also enable the precise measurement of the phosphorylation status of proteins of interest. They can easily help you measure and quantify the effects of certain stimulation / experimental conditions on target protein expression in different cell lines. The qualitative determination of target protein concentration is achieved by an indirect ELISA format making these assays convenient. 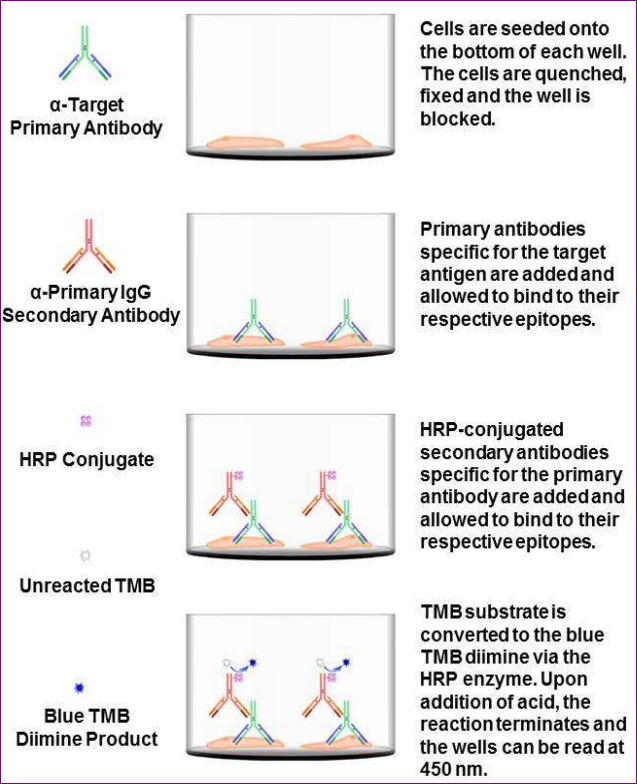 Globally, the target protein is captured by target-specific primary (1°) antibodies while the HRP-conjugated secondary (2°) antibodies bind the Fc region of the 1° antibody. Through this binding, the HRP enzyme conjugated to the 2° antibody can catalyze a colorimetric reaction upon substrate addition. A monoclonal antibody specific for human GAPDH is included to serve as an internal positive control in normalizing the target absorbance values. Following the colorimetric measurement of HRP activity via substrate addition, the crystal violet whole-cell staining method is used to determine cell density. After staining, the results can be analyzed by normalizing the absorbance values to cell amounts, by which the plating difference can be adjusted. If a phosphorylated target is being detected, an antibody against the non phosphorylated counterpart will be provided for normalization purposes. 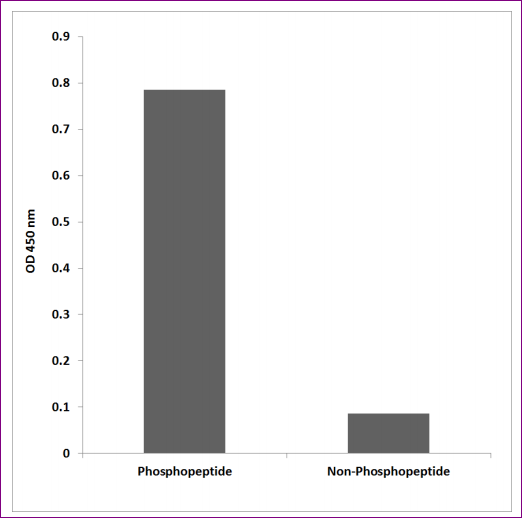 The absorbance values obtained for the non-phosphorylated target can be used to normalize the absorbance values for the phosphorylated target. Access CytoGlow™ Cell-Based ELISA Kit for in-cell target protein expression profile measurement (cat. nr 207CB*) here. 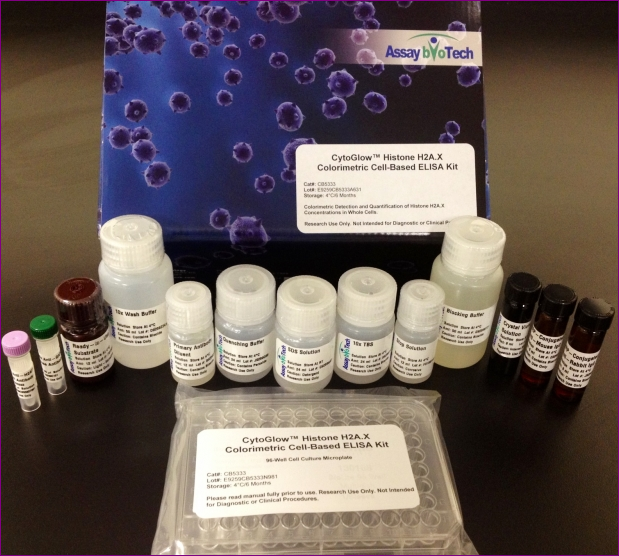 Access CytoGlow™ Cell-Based ELISA Kit for in-cell target protein phosphorylation status & expression profiles (cat. nr 207CBP*) here. 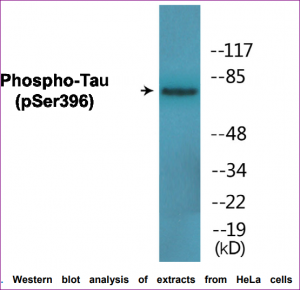 The Tau (Phospho-Ser396) Cell-Based ELISA Kit (cat. nr 207CBP1697) is a convenient, lysate free, high throughput and sensitive assay kit that can monitor Tau protein phosphorylation and expression profile in cells. Screening for the effects that various treatments, inhibitors (eg. siRNA or chemicals), or activators have on Tau phosphorylation. In this kit, the Anti-Tau (Phospho-Ser396) antibody is a rabbit polyclonal antibody for which the specificity has been validated & tested on Western Blots as described in the figure on the right. Interestingly, this protein band can be blocked by the synthesized immunogen peptide. This Anti-Tau (Phospho-Ser396) antibody is also highly specific for the phospho-peptide in comparison to the non-phospho peptide counterpart, through an ELISA test (see diagram below). by WB on human, mouse, and rat tissue lysates for specificity). Due to these multiple validations, all the CytoGlow™ kits are designed to give high sensitivity and low background with high performing signal-to-noise ratio. To date, this product-line cover the detection of over 1,000 different proteins in adherent and suspension cells and 1,000 of phosphorylated targets. Detection of protein markers in adherent and suspension cells, accessible here. Detection of phosphorylated protein markers in adherent and suspension cells accessible here. Looking for more reagents for your biomarker & cell signalling studies? Don’t hesitate to reach out to your local tebu-bio contact to learn about other innovative reagents for your research, or discover more about the kits we looked at above, and how to use them in your research projects. When (and why) should you decide to outsource your assay? Apart from the obvious considerations (lack of human resources to perform your project, need to hurry up your experiments to match a deadline, lack of equipment..), there may be other reasons to rely on tebu-bio’s lab expertise to perform your biomarker quantification for you. If you are on a one shot experiment where you want to optimize your results and benefit from our expertise, outsourcing may be a better choice than doing it yourself. Although the technology is quite simple, tebu-bio’s lab is very experienced and is likely to generate better quality data than you would in a single trial. To find out more, contact us about our laboratory services here.